Earla's Furniture & Design Center is a family owned & operated business. Our new 18,000 sq. ft. showroom is conveniently located in North Royalton at 13750 York Road, and on the web at www.earlas.com. 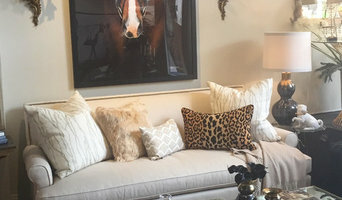 At Earla's, we shop the world to find unique furniture, art, lamps, area rugs & decorative accessories......all at surprising affordable prices. For instance, our sofas come in your choice of beautiful styles, fabrics & leathers with prices starting at just $699. Need help? Our friendly & knowledgeable staff will help you with any size design project & budget. 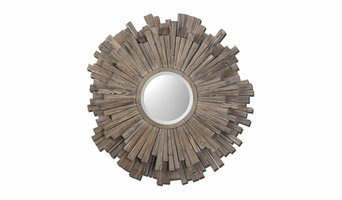 Arhaus offers one-of-a-kind handcrafted home furnishings reflective of a distinct global point-of-view. Arhaus collaborates with skilled artisans all over the world who craft its many exclusive collections, which are complemented by timeless upholstered pieces (slipcovered, leather and custom-ordered seating), indoor and outdoor dining tables and chairs, bedroom and office furniture, seasonally-inspired accessories, private label bedding, throws and accents, and more. Made of the world’s finest materials (with attention to sustainability), products are presented in dramatic lifestyle settings infused with original architectural elements imported from Parisian flea markets and Tuscan villas, hand-painted murals, Arhaus Relics, or repurposed antiques, and the freshest botanicals sourced locally in each store market. Showroom Hours: Tues-Sat: 10am-6pm Pavilion Home & Floral offers integrity and personal service combined with products that are unique, classic and made to last. We have a range of select and carefully curated accessories and products for your home. These are either choice vintage pieces of designs from home and abroad. Our space allows for creativity and a flow of ideas that will inspire anyone who visits. 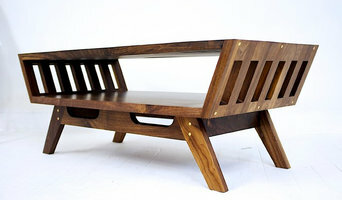 Moderncre8ve is located in Cleveland Ohio, and specializes in Modern and Midcentury Modern hardwood furniture. All of our pieces are handmade one at a time, using locally sourced hardwood lumber from Amish country. Moderncre8ve's philosophy harkens back when to when i was a young. Our dad built our first house from the ground up, and built all of our furniture when we were kids. Growing up in this enviroment instilled in me early on that furniture is something that should not only serve a function and form; but be something that is timeless, beautiful, and most importantly; something that is made with love and care. We approach every order and custom order with the utmost respect; and treat our customers like they are family. Check our 5 star feedback! Ordering something sight unseen can be a bit daunting, and we are here to answer your questions; update you with build pictures of your build along the way and give you a hands customer service experience you won't find from high end retailers like Design within Reach, Room and Board, Crate and Barrel, Bo Concept...Many of these retailers use inferior materials, mass produce them in overseas (often in sweatshops) while inflating their retail prices to meet their overhead. This is then passed on to you, the consumer via slick marketing materials and advertising. Sadly, these are all shortcuts to meet their bottom line. Moderncre8ve offers better quality at a lower price because we work directly with our customers as well as local lumber mills and sawyers, while providing custom dimensions and options these companies can't. Welcome to Herman’s Furniture! We are your locally-owned, award-winning, full-service furniture and design store. Our goal is to work with our customers to help you love your home. We strive to get to know our customers personally, build your trust, and help you avoid costly design mistakes. We know that choosing furniture can be overwhelming. With a full line of quality furniture, mattresses, accessories, lamps, area rugs, and custom window treatments, the designers at Herman’s Furniture can help you choose the right pieces to create the room or entire home of your dreams. Our design service is complementary, and we can work within any budget. We have two locations to serve you, Sandusky and Avon Lake. Come stroll through our 25,000-square foot, Sandusky showroom or our more intimate design studio in Avon Lake, and see what inspires you. We promise that no salesperson will stalk you as you browse, but assistance is yours for the asking. Give us a try. We think you will be pleasantly surprised! Since 1982, Gomillion Furniture has served discerning individuals, residential and commercial designers, facilities managers, mills and manufacturers with quality furniture restoration and refinishing services throughout the region. We also provide white glove moving and storage and we are expert piano movers. Every product we make is marked with the location from which its wood was harvested. We laser etch the location directly onto our smaller products. With our larger products (tables, stools, mirrors…) we inlay a source “coin” - A 1.5” diameter maple disk that features the source locations address. Since it's launch in 2012, Kast Concrete has been the niche-hardware leader in concrete knobs. Our unique process combines innovative prototyping with traditional concrete casting. Each knob is designed and handcrafted in Colorado by Grey Hensey. Made one-by-one, every knob is completely unique. The savvy dames at All Things Savvy, Inc. will take your interiors to the next level providing the wow factor you desire. With over fifteen years experience in the interior design field, Sarah Simpson will transform both your interiors and exteriors. We also provide event design services making your special day the event of your dreams. Our studio and inspiration retail show room is located in Avon Lake, OH. We offer full design guidance and coordination for both renovation of an existing space as well as new construction. We strive to provide our clients with a design that reflects their own personal lifestyle and sensibility. It all begins with an in-home meeting. ~Lets schedule your initial consultation. Laura of Pembroke is a wonderfully diverse, family-owned, retail boutique with a strong European influence. Local owners, Laura Sirpilla Bosworth, Veronica Sirpilla and John B Sirpilla started their venture, their "dream", in the Cleveland area in 1987. In 1993, they relocated the store to its present site in Canton, Ohio. The store originally featured only women's clothing and accessories. The dream grew, and partners Susan and John A Sirpilla joined the venture. Home furnishings and accessories, gifts, and an online presence became a wonderful part of our mix. In addition, interior design consulting, personal shopper services and shipments throughout the country followed. The dream grew again, and Laura's daughter, Lauren Bosworth, joined the team. Graduating from Miami University's Farmers School of Business, she brings a fresh insight to our buying mix, analysis and internet ventures. Please stop in to experience our gifted personal stylists and amazing support team! Book an appointment with one of our designers to take your home to another level that brings LA and New York together blended with timeless treasures from Europe and beyond. Featured monthly festive events, convenient storefront parking and prices that range from reasonable to frivolous await you! Indulge in a little or a lot, and find a new rhythm at Laura of Pembroke. DTW Woods is a new division of Schultz Upholstery. Schultz Upholstery has been family owned and operated since 1938. Specializing in recovery and restoration of fine furniture. We made our first tables for our own use as a hobby and for friends and family. People loved our tables, so in late 2017 we started DTW Woods. Since then we have taken our tables to trade and art shows and now concentrate on custom order tables for our clients. We have recently moved DTW woods into a new 3,200 sq facility, prior to that we made them in the upholstery shop. We quickly realized that wasn't enough space to produce the amount of orders we had. We are very excited about continuing our family legacy of producing fine furniture. Bolster is a full-service interior design studio with a simple mission: to make your space live up to its full potential. Owner Liz MacKeigan, ASID draws on a decade of design experience to transform homes and commercial spaces into something extraordinary. Bolster started in 2014 as a side project and has recently expanded to offer full interior design services to clients located in the Cleveland area, as well as those wishing to receive consultations in an online format. The firm's core belief is that good design and refined details should be accessible to anyone, regardless of budget. The Ohio Design Centre is a group of exceptional showrooms featuring the finest custom furniture, exclusive fabrics, wall coverings, rugs and floor coverings, lighting, globally-selected accessories and surface materials from over 400 premier manufacturers. The Showrooms at this 100,000 square foot building feature beautifully executed room settings showcasing design collections that inspire and invite solutions for your home interior. It is the premier marketplace for professional designers, architects, building contractors and specifiers from all over Ohio, Western Pennsylvania, Western New York, Eastern Indiana and Northern Kentucky who search and select the finest furnishings for their clients. Showroom hours are Monday through Friday, 9:00 a.m. to 5:00 p.m.
Take your time on any buying decisions. If contemporary is your style, don’t buy something traditional because it’s on sale. Many Ohio home furnishers offer interior design consultations or room planning guides to get you started. Whether you decide to work with a home decor specialist or to become your own expert, it’s important not to rush the furniture-buying process. Visit plenty of Parma Heights, OH showrooms and stores so you can feel comfortable with your purchase. Find furniture and accessories manufacturers, showrooms and retailers on Houzz. Narrow your search in the Professionals section of the website to Parma Heights, OH furniture and accessories, then choose the nearest metro area for showrooms and retailers. Or you may want to look through Ohio photos to find designs you like and contact the furniture manufacturers and showroom galleries directly.